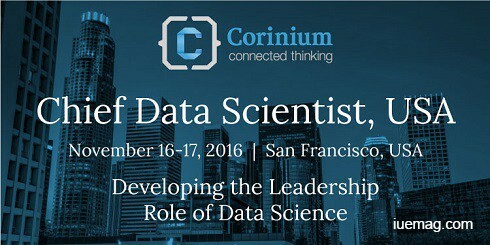 The Data Science leadership role will be brought to the fore in San Francisco this November! The launch of the inaugural Chief Data Scientist, USA is set for November 16-17 2016 at the Hilton Financial District, San Francisco and brings together a high-level community of senior data science practitioners to get a detailed picture for developing the leadership role of data science. Neil Eklund, Chief Data Scientist, Schlumberger explains how data science and advanced analytics provide the tools that could result in millions of dollars of increased profit for your organization and competitive advantage over your rivals. Satyam Priyadarshy, Chief Data Scientist, Halliburton examines the tools and techniques needed to translate data science insight into business enhancing action. What does it really mean to be a Chief Data Scientist, and what strategies will lead you to success? In this keynote presentation, Ashok Srivastava, Chief Data Scientist, Verizon asks where should analytics end and data science begin by giving his in-depth analysis on the Chief Data Scientist role. Mouneer Odeh, Vice President & Chief Data Scientist, Thomas Jefferson University & Jefferson Health will create a compelling case for change and overcoming resistance in following science over business instinct. What does it really mean to be a Chief Data Scientist, and what strategies will lead you to success? Where should analytics end and data science begin? Discover the path to establishing a truly data-centric culture and realizing organizational change: The compelling case for change and overcoming resistance in following science and not business instinct. The Data Scientist as a Partner in Success - Building Positive Relations with Internal Stakeholders: how can we convince other teams to work constructively with data science?